For parties, it’s so lovely to have big displays of cakes, cookies, and other sweets, all on white ceramic cake stands (like the ones Martha Stewart makes each year for Macy’s, which I adore!). But what if you need a whole bunch of extra cake plates for one particular party, or if you’re limited on budget? 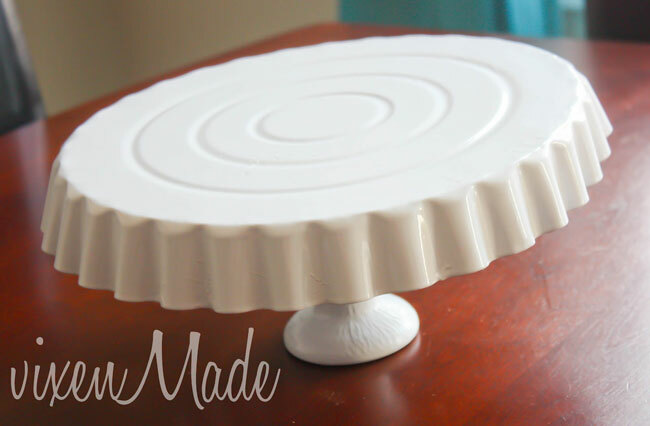 Well, here’s how to make a cake stand… for just two bucks! That’s the magic of the dollar store and a little spray paint! 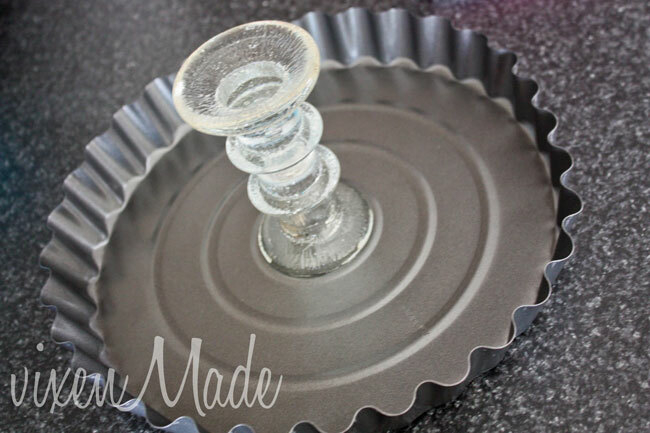 Then, she glued the candlestick to the tart pan using Amazing Goop brand glue. After allowing the glue to dry, she applied white spray paint, and voila! A brand new white cake plate! 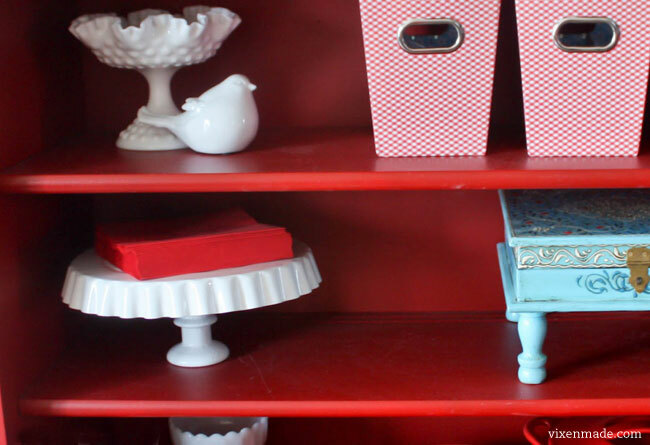 Doesn’t it look fabulous on Victoria’s red hutch? You could make several plates with little more effort than just making the one, which is fantastic. You could make them in various heights by using different candlesticks, and you could stack them up as “double decker” stands, too. Just one word of caution: be sure to put something in between your food and the spray painted surface. Cupcakes in wrappers would be fine, but you wouldn’t want to put “unwrapped” food right on the stand. A cut out circle of wax paper would be an easy way to make the stand food-safe. Thanks SO much for featuring this!! I'm still so flattered! Check me out at www.ETSY.com/shop/PooLaLaDiaperCakes !!! So clever! 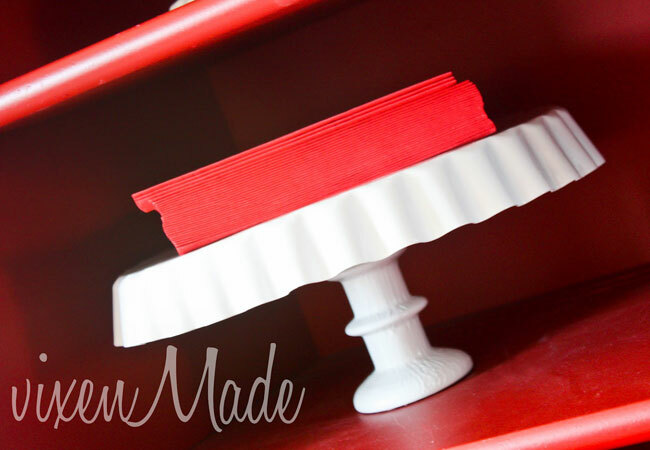 And this allows you to have LOTS of pretty cake stands at a fraction of the store price! YES! : ) We totally think alike - I'm picturing them made in multiples, too! It would be so fabulous. You could even paint them all different colors for an ombre effect (for example: white, light pink, medium pink, and dark pink). Or rainbow colors! Agreed! It's amazing what you can find at the dollar store sometimes, isn't it?! Just wondering...is spray paint food safe? Hi Michelle! It is not - that's why I added the disclaimer "Just one word of caution: be sure to put something in between your food and the spray painted surface." Better safe than sorry, for sure! You could take it one step further and spray the inside and when needed for like nuts or candies, flip and use and put a flower or something in the candle holder. Great idea otherwise! I'm going to make this! Love this idea! but would the candlestick hold the weight of a 2 tier cake?? I can't find those pans at any of the dollar stores in my area. Where did you find yours? I also like to take my cake plate and turn it upside down and use it to place small appetizers or cupcakes and place small flower or candies or food picks in the candle area. Wish I had seen this before I spent money on a "martha vineyard" cake plate that this one is almost a duplicate of. Love your website. This is great. Gonna make for our church bake sale display. And to sell at our church Christmas Bazaar. How did you get the paint to stick to the glass candle stick? Love this! We are ordering several different cakes for my parents 50th wedding anniversary and have been looking for an inexpensive way to display them. Thank you! I've tried this with another brand of glue with less than awesome results :-( I'm excited to have another option! But, how can I make it food safe? 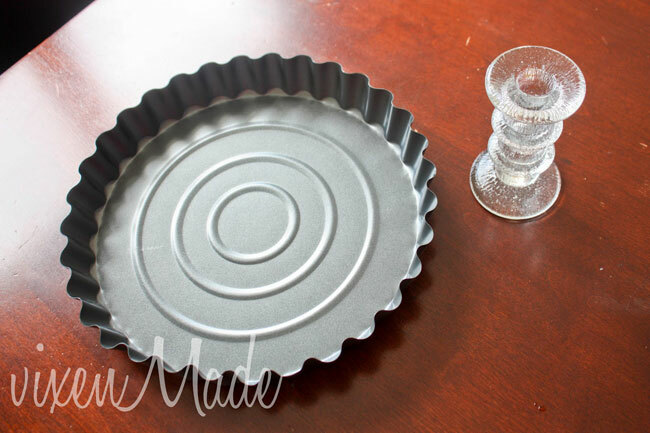 I've seen this idea before but the issue I've run into is all the tart pans I'm finding are not solid but have the removable bottom. Anyone know where we can buy solid pans? Hi Gina! Sorry, I don't know. you could also use those pretty doilies from the dollar store to put on the cake stand. which I love by the waycan't wait to try it. the doilies come in various sizes and colors . I'm going to do this for my wedding, I already have the crystal plates.